Please refer to our stock # td1 when inquiring. These fantastic earrings were made by contemporary designer jeweler, Tony Davis of Corrales New Mexico. Tony creates one of a kind hand forged pieces often from silver and gold ingots which he pours himself. 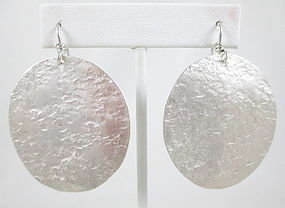 These showy earrings are 1 3/4" in diameter and have the hammered texture finish which is a signature look to his pieces. They are in excellent condition and are signed and numbered Tony Davis 925 with an additional "I" for ingot. Each earring is 9.3 grams and both are comfortable to wear. They are circular in shape and not oval as they appear in the photo.